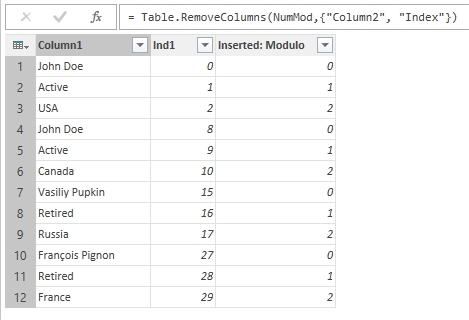 You can see that the report that we need to convert, composed of several tables with different number of rows (this prevents us from using a trick with a column index for grouping rows). Each table is preceded by a header of several rows. 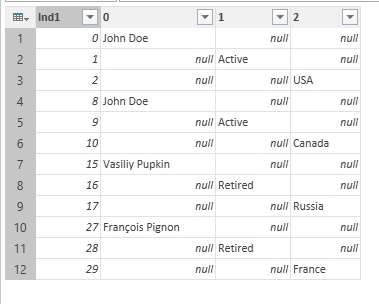 These rows form the unique header, but at the same time, individual values in them are not unique and may be repeated in the headers of other tables. As usual, there are more than only one solution of this task: we can use VBA, we can use Excel formulas, but we want to use Power Query (“Get & Transform” in Excel 2016 or query editor in Power BI Desktop). And yes, we can do it in Power Query without one hand-made “M” language code line – just with UI. The sample workbook for this case can be downloaded here. 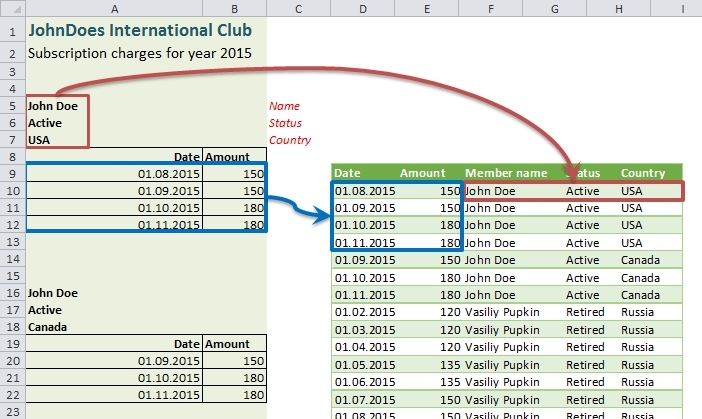 To make a story from this case, let it be a monthly members’ charges report for the mysterious “JohnDoes International Club”. This report differs from the same in previous post with not only extended header, but also Jane Doe was replaced to John Doe from Canada to make duplicates in the original data. I will do all transformations in the same workbook and that’s why I use a named range “ChargesExt” to refer to a data on the sheet. 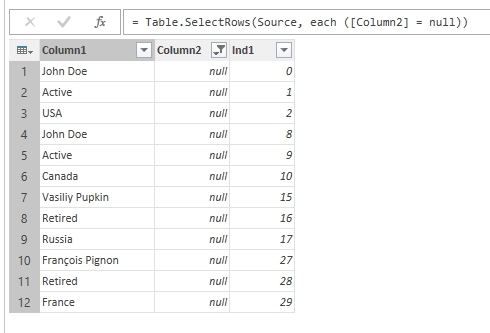 But if you don’t want to add named ranges, you can make a query from another workbook to an Excel file (if you make a query from Power BI, it is almost only way). Then you need to drill not to the named range, but to a sheet in this file. The other way is to change original source sheet by creating an Excel table on it, but I don’t like it. Let the source be untouched. First of all, we need to prepare data by removing all unnecessary info. 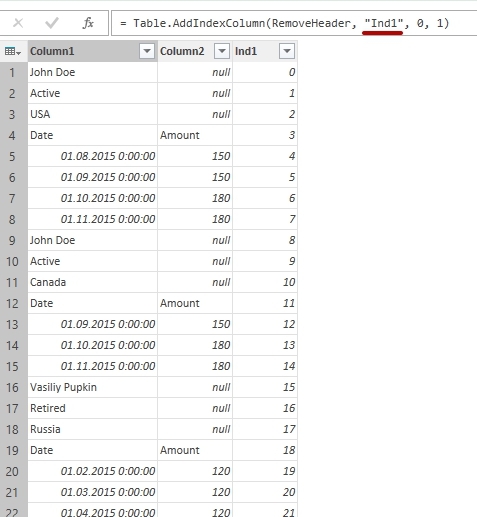 Open Power Query editor with empty query. Note that I changed automatically generated name of “Index” column to “Ind1” manually editing formula of this step, but it is not necessary. But how to combine these two queries? Which column must be specified as a binder, so then we can definitely attribute “header” to the appropriate table? In fact, the sole feature, determining the relative position of each “header”, is the row number that can be assigned to the relevant part of the report. 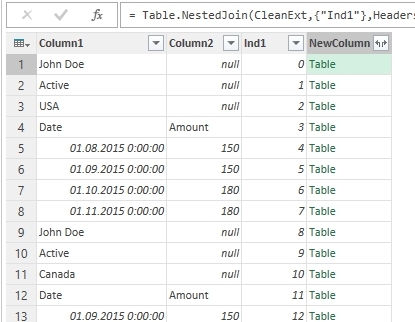 That’s why we added index column to the “CleanExt” query. So in the new query we need to save at least one row number for each “header”. Right-click on “CleanExt” query in “Workbook Queries” panel and create a linked query. First of all, remove all “non-headers” applying filter to the “Column2” by select only “(NULL)” values. Add one more “Index” column: we need it for pivoting. Select last column and pivot it! 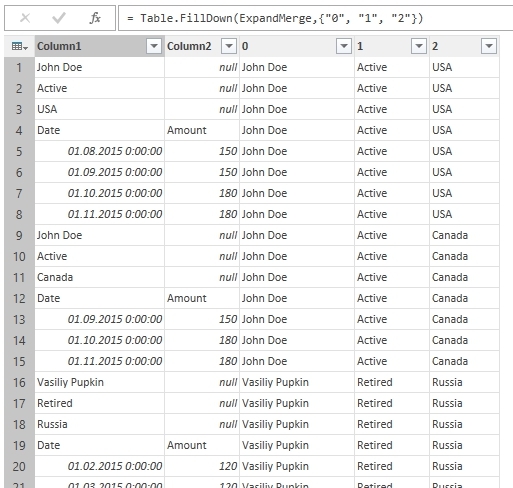 Select newly created columns “1” and “2” and go to Transform – Fill Up. If you click next to green “Table” word in new column, you can see that to each first row of each “header” connected a table of 3 columns, and, as it linked by the same index number, it connected correctly. Expand “NewColumn” by clicking on two-way arrows near its header. Remove now useless header rows by applying filter to “Column2”: uncheck “(NULL)” and “Amount” in filter options. Change data type in each column before loading it to a sheet. Is it what we want to get? That’s all. I named this query as “ChargesExtByIndex” and “Close & Load” it ot a sheet. PS: In the sample workbook you can also find another query, named “ChargesExt R1C1”. This is my exercises with relative row references in Power Query to perform such transposing without merging two queries. It is Excel-style approach, which can be used on not-so-big data sources (it could cause resource consuming operations when applied to a big data sets). I find it also very interesting. I have a question, how to make to add special repeating index column (0,1,2,0,1,2,…,0,1,2 etc. ), if there are non repeating items like (0,1,2,3,0,1,2,3,4,0,1,2,3,4,5,0,1,2,3…,0,1,2,3 etc.) but still it is possible to filter by date. I think you mean “what to do if items in the header of an each table can be with different fields”, i.e. not only “Name”, “Status”, “Country”, but sometimes there could be “City” as 4th field etc. 1. 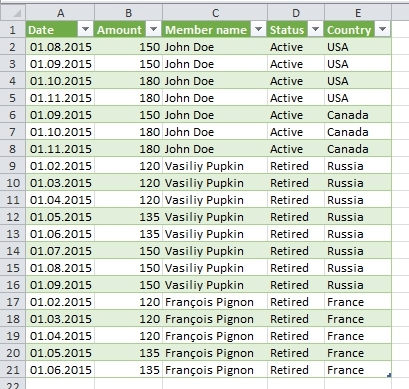 Is in the start of each data tables is the cell with the same value like “Data”, i.e can we somehow mark where is datatabe start. 2. Is there any empty row or other divider that could be found BETWEEN groups. I.e., can we somehow mark where is datatable ends, before the next header. 3. Do the header rows have a field names, or only field values? I.e., is there rows like “Name: John”, “City: Manchester”, or only “John”, “Manchester”? If so, then there is several ways (this is common place in Power Query) to make this transformation. You can send me a depersonalized sample to info (at) excel-inside (dot) pro, I’ll take a look and will try to give you an advice.